A flooded basement may not be costly, but it could be dangerous. Damaged heating, ventilation and air conditioning could be subject to malfunction or corrosion, especially if debris from a flood interferes with your system. If your basement is knee-deep with water, you need to take action fast. Here are four actions to take right away when your basement is flooded. With a flooded basement, damage could be done to your heating and cooling equiptment. 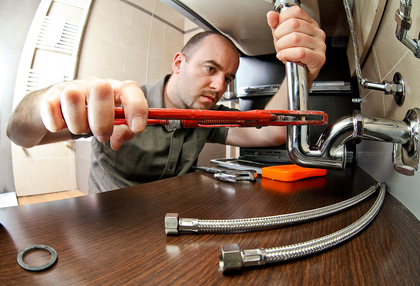 Never attempt to fix your heating or cooling equipment yourself. Instead, call in the professionals who will be able to perform repair work on your flooded system or replace damaged units with new equipment and parts. A qualified, experienced professional will be able to resolve the problem quickly without risking further damage to your HVAC system. It's sometimes difficult to tell whether flood water has damaged gas appliances like heaters and boilers, especially when the outside of the unit is dry. It's better to be safe than sorry: Get gas appliances checked out by an expert who can identify any corroded controls or valves and fix any underlying issues that could cost you in the long run. If flood damage is irreparable, consider replacing your HVAC system with an energy-efficient model. A new unit can save you money on energy bills, and you might be eligible for rebates on gas or propane systems. Local plumbers can install a new, energy-efficient HVAC system quickly, which could be a more attractive option than conventional boiler and air conditioner repair. Water from a flood can carry chemicals that can corrode your electrical furnace and damage the thermostat, coils and controls inside. According to the Air-Conditioning, Heating & Refrigeration Institute (AHRI), flood water can create a safety hazard, and homeowners should have their unit checked by a contractor. Total flood insurance claims average more than $3.5 billion a year, with 914 claims made in the state of New York alone in 2014. Regular heating and air conditioning servicing could prevent you having to make an insurance claim in the future. A HVAC professional can install flood protectors such as safety switches and flood detectors to safeguard your basement. When your home's infrastructure is on the line, it just makes sense to call the professionals for help after a flood.